If you prefer to take the back roads home and enjoy your time behind the wheel, then the Ford Mondeo is a better bet. However, if you simply want sturdy, reliable and comfortable transport from your three-box saloon, then the Volkswagen Passat delivers on all fronts. Volkswagen's family car is one of the top three-box saloons on the market. While the Ford Mondeo is widely regarded as the driver's choice the Passat has always had comfort, refinement and build quality on its side. Tough, reliable and more than happy to absorb its fair share of miles, the VW makes a great case for itself as a comfortable family tool - just don't expect to be thrilled. You're more likely to find a four-door saloon Passat than any other, but it's also available as an estate and a stylish coupé version (called the CC) joined the ranks in 2008. You're spoiled for choice when it comes to engines and trim, too. 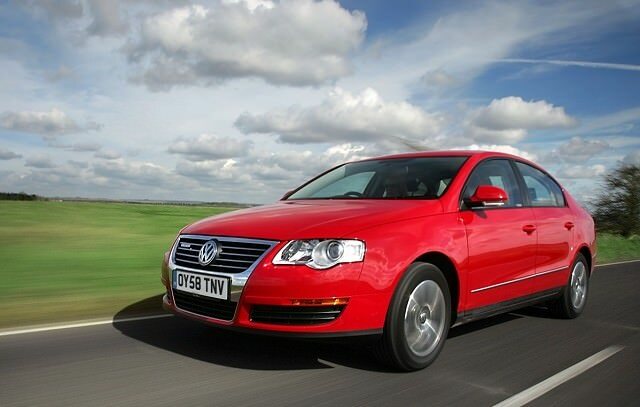 The Passat came fitted with an arsenal of powerplants from the VW stable, from simple 1.6-litre FSI petrol models through more powerful and cleaner TSI engines and a series of TDI diesels. You're not short of choice when it comes to trim levels either. They range runs from S through SE, Sport, Highline, SEL, Highline Plus and R-Line. Then there are the BlueMotion models - eco specials fitted with 1.6- and 1.9-litre TDI diesel engines promising spectacular economy and low emissions. It goes without saying that the TDI diesel engined models make the most sense - especially if you're buying a relatively recent version with CO2-based tax. They're cheap to run and robust, and while the conventional versions offer a fine blend of economy and performance, you can sacrifice a little of the latter and go for a BlueMotion model to major on eco-friendliness. They cost more in the first place, but they'll also hang onto their value better in the long run.